It’s no wonder why Runner’s World named the 767 the best update of 2006. This shoe offers excellent transitional support and cushioning, the perfect mix of comfort and mild pronation control. The 767 is a great choice for a runner who needs more support and technology from their running shoes without a premium price. Your legs and feet will thank you with TS2® Transitional Support for stability and the ABZORB® Strobel Board for a full length of maximum shock absorption and comfort. Exciting new additions to the 767’s are the Ortholite® foam inserts. These inserts not only add comfort with your steps, but they fight odor causing bacteria to keep your shoes clean and ready to wear. The 767 offers excellent cushioning and support. This shoe is recommended for any runner seeking more support and slight pronation control from a running shoe. The added midfoot support make the 767 a great pick for competitive training. 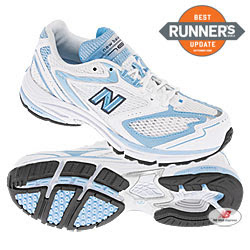 At Shop New Balance, we are driven to be more than the official online store for New Balance gear. We want to be a resource for athletes of all types; from marathon runners and competitive athletes to outdoor hikers, casual walkers and gym regulars. This blog is a collection of real-life product reviews and information on New Balance news, products, training tips, motivational stories, and any new information that might inspire you. We also want to spotlight two organizations sponsored by New Balance: Lace Up for the Cure®; the Susan G. Komen foundation in the fight against breast cancer and Girls on the Run®; an organization to encourage healthy lifestyles for pre-teen girls through running. If you have any stories or comments you wish to share about New Balance and your experiences as an everyday athlete, please let us know. We always want to hear from you.